Kawachi is the most prominent of the younger artists who have led to revival of the woodblock print in Japan. The woodblock was the natural and traditional medium for Japanese graphics; in the early 20th century it underwent a reassessment and revitalisation with the advent of the 'Sosaku Hanga' (Creative Print) movement which stressed that the artist should take part in every process in the production of his prints. From 1945 until about 1970 'Sosaku Hanga' became virtually the graphic establishment of Japan, although other techniques were beginning to erode the dominance of the woodblock. 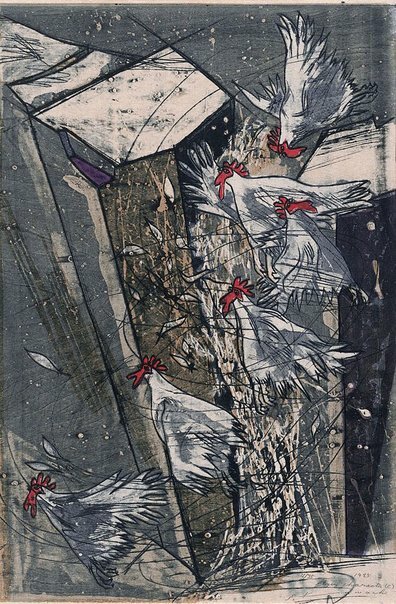 Kawachi, his prints appearing in the second half of the 1970s, has reasserted the importance of the woodblock technique. Kawachi was born in Yamanashi Prefecture and studied at Tama University of Fine Arts. He currently lives in Tokyo. In 1970 while still a student he participated in the 38th Japan Print Association's Exhibition as a public subscriber and was awarded the New Artist Prize. Kawachi is concerned with expressing the stress and tension of contemporary society. He depicts the breaking point where things can be endured no longer; the moment of disturbance, fear and anxiety. His prints have great power and energy, with solid thrusting pylons taut and strained within an infinite and daunting space. His technique contributes to the expressive and unrestrained vigour of his prints. One of the most attractive features of his prints is their varied surfaces. He exploits the impression of the grain of the wood and in his blocks he uses the veneer with its rougher more varied and more unpredictable surface. He chooses his paper for its texture and colour. When he prints he reverses the order of traditional printmaking, that is, he prints the black outlines last, after the colours. He emphasizes the effect of the black ink by printing the ink line in intaglio, engraved into a block which is varnished. The combination of the black outlines plus the superimposition of clusters of scratchy lines over parts of the composition adds to the edgy nervousness of the prints. The fowls he depicts striving, in great haste and anxiety, to fly over, around or through massive, frightening pylons. The images are metaphors for our fears when confronted with the power of the uncontrollable forces modern urban society is creating. The single small wooden chair seen in one of these prints is a favourable subject of Kawachi’s and the device of presenting it in a sort of time-lapse sequence is one he has used elsewhere. Asian Art Department, AGNSW, 1986. Signed l.r., pencil "S.Kawachi". Dated l.r., pencil "1985".